The pirate speaks,"Time t' take some rest and relaxation by goin' ashore and gettin' into a slot tournament." The pirate speaks,"Time t' take some rest and relaxation by goin' ashore and gettin' into a slot tournament. ThisisVegas is holdin' one in August that tops up to $25,000. That be alot o' doubloons mate." 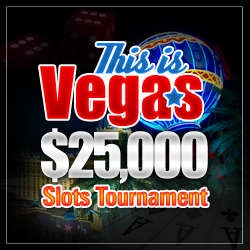 This is Vegas is going to host a Player tournament, the $25,000 Slots Tournament, for the month of August. We have just finished putting it together and we think this will be an exciting summer event. Information on the tournament follows below. Players will be emailed Aug 1st explaining the rules. For further details you can find the contest rules on the website. The Pirate speaks, "BuzzLuck is what an online casino should be"
The pirate speaks,"T' Pirate has come across a new territory on t' high seas o' t' internet and wants t' mark t' spot where thar be new treaaye for all t' plunder. A good reliable source, me snitch, reported t' me with t' treaaye map and details and here be what we find...we got a real BUZZ from this one!" The Pirate speaks, "Online casino is offering up Gold Tickets in their Treasure Chest"
"T' Pirate has come across a new territory on t' high seas o' t' internet and wants t' mark t' spot where thar be new treaaye for all t' plunder. A good reliable source, me snitch, reported t' me with t' treaaye map and details and here be what we find... a GOLD Ticket in a Treasure Chest"
The Pirate speaks, "Full Tilt Poker online poker site Turned FIVE"
"Full Tilt Poker Turned FIVE so we went ashore t' celebrate t' online poker mate's birthday and partake in the BUST-OUT Bounty Tournament"
Celebrate FIVE years of Full Tilt Poker from July 9th to July 19th. Deposit for as little as $10 and&nbsp; play for more than $1,000,000 in prize money, 5x Full Tilt Points and birthday-sized bonuses for pro knockouts and referring your friends. Earn Full Tilt Points five times faster for 55 hours, starting with a special 24 hour 5X Happy Hour on Tuesday, July 14th at 00:05 ET. Turn five FTPs into your share of $5K with $5K Every Five Hours tournaments. Play Birthday Money Sunday for more than $2 million in guaranteed prize money on July 19th. We’ve increased the guaranteed prize money in our Big Money Sunday tournaments by $700K. Knock out a member of Team Full Tilt in any tournament from July 14th to July 19th and earn a 5x Bust-Out Bounty. The pirate speaks, "We caught up with Ol' Blue Eyes"
The pirate speaks,"Party Casino be t' world's largest online casino and it has just got even bigger with 13 new games added! T' headline act o' t' release be Sinatra, a musical slot tribute t' Ol' Blue Eaye. " A PartyCasino.com spokesman said: "Sinatra is top of the bill of our latest release and we encourage players to embrace the musical interactivity of this great new game. We're also delighted to add 12 new others including the classic Dolphin Reef, the Fantastic Four and Hulk themed games." The Gold Mega Jackpot has passed its record level and is still growing and waiting to be hit! To break the record, the Gold Mega Jackpot had to surpass the staggering $1,571,974 paid out to one player on the 8th October 2006. It currently stands at just over $2,600,000! Gold Mega Jackpot games on PartyCasino.com include The Godfather, Super Star, Super Joker, Super Fortune Wheel, Super Mystic and Mega Fortune Wheel. PartyCasino.com offers over 60 games and pays out over $10 million EVERY DAY to players and continues to expand rapidly. Highlights include film themed slots such as Mission:Impossible, The Terminator, Top Gun, Saturday Night Fever, Gone with the Wind and Rambo.